Email Requirements: The following must be included with the email artwork files: Distributor Name, Contact Name, Contact Phone Number, and Purchase Order Number. A black & white version of artwork must accompany faxed purchase order in order to guarantee the integrity and content of the artwork. Software: Graphic computers are Windows based PCs. All files must be a compatible format. The factory uses the latest versions of Adobe Illustrator and Adobe Photoshop. For scanned images, minimum resolution is 600 dpi. Artwork cannot be larger than 8 MB. Accepted File Extensions: .eps, .tiff, .ai, .psd, .pdf, or .jpg. Pad Print & Laser Engraved: Vector art with type/fonts converted to outlines or curves. Colorfy: Full color artwork required. PMS color match not available. General Info: The quality of your artwork will determine the quality of the imprint. The factory cannot imprint halftones, screens, or shadows. The factory is not responsible for receipt of electronic files, call factory to verify receipt. The factory is not responsible for email transmission delays. Customer service must be notified of revised copies of artwork. The factory is not responsible for errors in handwritten copy. Purchase Order Content: Send orders via mail, fax, or email to order@illiniline.com. Each order must contain Distributor Name, Address, Telephone Number, Shipping Address, Required Shipping Method, Event Date (if applicable), Purchase Order Number, and Pertinent Production Information to include, but not limited to, Item Number, Item Description, Item Color, Imprint Color, Imprint Location, Imprint Description, and other Special Instructions. Purchase Orders should also contain the distributor’s ASI number if applicable. Credit Card Payments: Orders paid by credit card will be run at time of proof approval. Any open accounts paying for orders by credit cards at a later date will incur a 3% administrative fee. Pricing Policy: All pricing is subject to change without notice. Please refer to www.illiniline.com for the most current pricing. Pricing featured by another agency is not valid. Pricing featured in catalog and throughout General Information is listed in US Dollars/FOB Factory. Canadian Dollar pricing is noted where applicable and refers to Canadian Services Pricing (CAD). Contact factory for further details or visit www.illiniline.com. Canadian Services Pricing (CAD): Pricing is in Canadian dollars and includes ground transportation for one complete shipment to one postal code serviced by UPS Ground. Duty and brokerage fees are also included in the price. For expedited freight, or required air shipment, contact factory for details. For business to business, import/export transactions, a 5% GST fee is added to the invoice as a line item and is processed via the UPS NRI system. All pricing is subject to change without notice. Setup Charge: Unless specified otherwise, the setup charge for straight line copy or for a logo is US/CAD $40(G). Refer to catalog for setup charges on silkscreened items, laser engraved items, debossed items, silicone wristband products, and embroidered plush. Copy Change Charge: US/CAD $25.00(G) per occurrence copy change charge applies to most items. Contact factory for details. Ink Change Charge: US/CAD $20.00(G) per occurrence for ink change during production. PMS Charge: PMS colors are approximate and will vary. 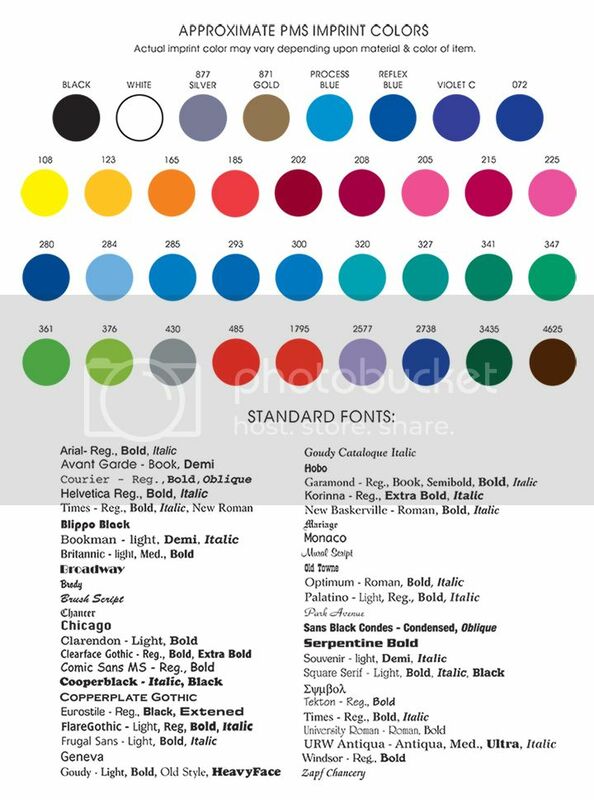 Add US/CAD $20.00(G) per color for all other PMS colors. Exact color match is not guaranteed. All “as close to” color requests will be fulfilled using the stock PMS colors. Art Charge: The factory will add type to a logo at no charge. To typeset straight line copy, add US/CAD $18.75(G) art charge. Supplied artwork must be camera ready. In the event that the artwork is not clean, crisp, and consistent, art services are available at US/CAD $25.00(G) per 30 minutes. Art charges are billed in 30 minute increments. Factory reserves the right to determine if artwork is a clean vector formatted file. Production Time: Standard production time for most pad printed products is 3 working days on catalog printed quantities for one color/location pad print. For quantities larger than end column, contact the factory for production time. For those items denoted with a 10 Days icon, please contact the factory for current production time as it varies. Production time will also vary for Silkscreen, Colorfy, Deboss, and Laser Engraving decoration. Contact factory for details. Rush Service: Rush service is an option for some pad printed items. Limitations may apply, contact factory for availability and complete order instructions. Multiple Color/Location Imprinting: For multiple color imprinting or multiple location imprinting, refer to catalog for additional run charges and additional setup charges. Order Confirmation/Cancellation: The factory is not responsible for faxed/emailed orders unless confirmed via phone. Factory will not accept phone orders. All confirming orders sent via email, fax, or mail must be clearly marked “confirming only”. Duplicate orders that are not marked appropriately will be invoiced. Order cancellations are subject to costs incurred at time of cancellation. Cancellations must be received in writing and will incur a charge of US/CAD $25(G) plus additional costs incurred. Paper Proof: US/CAD $6.25(G) per occurrence for order quantities less than 1,000 pieces. For orders above 1,000 pieces, no charge paper proof is required. Call factory upon faxed/emailed proof approval to ensure receipt. Spec/Preproduction Sample: US $18.75(G)/CAD $62.50(G) plus applicable setup charges. Allow 3 working days for sample, plus an additional 3 working days for full production following approval for 1 color/1 location pad print, catalog printed quantities. For multiple pieces or Govino 4 Packs, additional per unit charges may apply. Contact Factory for details. Blank Merchandise: US Dollar/FOB Factory blank items are sold at ½ minimum order quantity at end quantity price, certain exclusions apply. Several items are featured as blank items and therefore, regular catalog pricing applies. CAD Services blank items are sold at column pricing less 10%. Govino brands are not available blank. Less Than Minimum: US Dollar/FOB Factory add $25.00(G) with an absolute minimum of ½ of the first column quantity. For Laser Engraved Wristbands please add US $62.50(G). For less than minimum blank orders, see Blank Merchandise policy, and contact Factory for appropriate LTM fees. Less than minimum orders are not available using the CAD Services program. Contact factory for further details. Shipping: Catalog item weights are approximate and are subject to change without notice. Weights denoted in the catalog may reflect actual or dimensional weights. Please contact customer service for required freight quotes. Prepaid shipping charges will be invoiced at cost. Most orders are shipped via UPS Ground Prepaid with shipping charges added to invoice unless otherwise requested. UPS air or FedEx air service also available. All air shipment orders must be clearly noted on the purchase order. For US Mail service, add US/CAD $5.00(G) service charge per box. Standard postage rates apply. COD shipments are not permitted. Incorrect address/zip codes will be charged back at US/CAD $6.25(G) per box plus applicable freight. Factory is not responsible for any delays in shipment that are the result of the carrier. For China direct shipping for all Laser Engraved Wristbands please add $62.50(G). Freight Collect/Third Party Billing: All Freight Collect or Third Party Billing must be clearly noted on the purchase order with the correct account number. Any freight charges incurred by the Factory resulting from incorrect billing information supplied will be charged back plus a service fee of US/CAD $20.00(G). Split Shipments: Add US $5.00(G) per location for FOB Factory shipments. For CAD Services shipments, contact Factory for details as pricing applies to one complete shipment to one postal code. Foreign Shipments: All orders shipping outside the US must be accompanied with the proper documentation. Orders submitted without such will incur an additional charge of US/CAD $12.50(G). Repeat Orders: Repeat order set-up charges are US/CAD $20(G). Repeat orders must be marked with the most recent order number, invoice number, and invoice date. Order records are maintained for 24 months. Returns/Damages: All claims of damaged goods must be made in writing within 30 days of receipt of merchandise. Unimprinted merchandise returns are subject to 20% restocking fee plus applicable freight charges. Printed orders may not be returned without prior written authorization. A return authorization number must be obtained from the factory and must appear on the outside of the carton. Co-op Programs: Contact factory for details. Co-op programs are available on most items but exclude all items noted with the 10 Days icon in the catalog. Self Promotion Policy: Contact factory for details. Special pricing is available on most items; excluding those items denoted with a 10 Days icon in the catalog. Standard US/FOB Factory policy is one half minimum order quantity at end quantity pricing less 15% on pad printed, engraved, Colorfy, screen printed, and debossed items. Refer to regular catalog pricing for 10 Days icon items. CAD Services pricing is column pricing less 15%. Less than minimum orders are not available with CAD services. Overrun/Underrun: Factory reserves the right to overship/undership order quantity by 5%. For exact quantities, add US/CAD $30.00(G). Distributor overruns requested on purchase order will be invoiced at standard item pricing plus applicable shipping. Union Information: Factory printing employees are members of AFL-CIO Local 24. Union Label is available on most items. None of the items featured in the catalog are union manufactured. Sample Policy: Send sample orders via mail, fax, or email to sample@illiniline.com. All randomly imprinted samples under US/CAD $10 EQP value with an accompanying third party shipping number are sent free of charge. All blank sample requests will be treated as blank orders. Please refer to the blank order policy for more information. All other orders will be billed at the EQP value plus shipping. Samples will be shipped within 48 hours. All Govino 4 pack items will be billed at EQP value. Trademark Notice: The artwork, design, and other trademarks on products in this catalog are reproduced for display purposes only. They do not imply or suggest endorsement of such trademark or that the item was originally produced for the owner of such mark. Product Variations: Due to measures beyond the factory’s control, color variations amongst orders may exist. Factory reserves the right, without notice, to make changes to the appearance or functionality of products. Proposition 65: Illini is thoroughly educated not only on the regulatory standards, but also the challenges that Proposition 65 poses to consumers. The extensive and ever-growing list of chemicals recognized by the State of California to cause harm are routinely monitored. Illini evaluates each and every item based on its material composition for potential Prop 65 concerns. Research on the item’s material composition, laboratory recommendation, and past cases involving that material determine which chemicals to test for. Should Illini test and receive failing results, the item is either redesigned to include compliant materials with Pass results or discontinues the item. Prop 65 Testing Frequency: For the existing line, items are evaluated for compliance upon reorder/biennially barring any material changes made to the item within this time frame. For new items, this is included in the initial product development process. Prop 65 Labeling: Illini is in the process of transitioning the line to containing products without Prop 65 listed chemicals. Ultimately no warning labels will be affixed to our products. As this transition is ongoing, a select few items may require labeling in the interim as a precaution. These labels are applied to each product, regardless of shipment destination. This labeled stock is exempt from new labeling regulations as the update does not apply to inventory existing prior to the August 30th, 2018 effective date. We understand that a customer may prefer to label an item as a precaution regardless of Illini’s evaluation of the product. In situations as this, Prop 65 labels may be applied to any item not already featuring a warning label for an additional labeling fee. Please click here for a current list of interim labeled items. 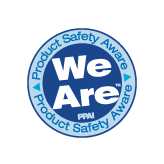 CPSIA: Illini maintains compliance with rules and regulations set forth by the CPSIA and follows CPSC protocol to determine if an item is a children’s product. Illini also considers the potential for childlike appeal, number of parts, and any other factors which may lead to the child receiving the product. If the current or potential item is considered a toy, child’s product, or child care article, the item is tested by an accredited third party lab for CPSIA compliance. Permanent and distinguishing marks, known as a tracking number, are placed on regulated items marketed to children 12 and under. Children’s Product Certificates are available for regulated items and can be furnished upon request or found on the Illini website. CPSIA Testing Frequency: CPSIA testing is conducted every 12 months if the stock is rotated frequently and the materials do not change. If a material change occurs within this time frame, then third party testing is performed. If inventory life exceeds 12 months, Illini conducts third party testing upon the next inventory purchase order.